Given the challenges and questions arising from the registration of substances under REACH, the European chemicals Regulation, this program, designed to find pragmatic solutions, was initiated in April 2014 by the European Commission and the European Chemicals Agency (ECHA) in partnership with industry experts. The previous round table, held on 9th July in Aix-en-Provence, took a decisive step for the 2018 REACH registration of essential oils. The guidelines on the characterization of essential oils, adopted in July, will help many small and medium-sized companies and enable the agricultural sector to address the 2018 registrations with more guidance. 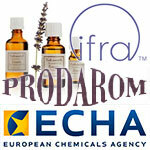 This fourth round table focused on particular aspects of the environmental impact of essential oils. It followed a working meeting organized by the European Chemicals Agency (ECHA), late August in Helsinki. The environmental data required for REACH are complex and pragmatic solutions need to be tailored to the specificities of essential oils.